Thanksgiving weekend has always been a super busy time for me. I was always either off for a couple days from grammar school or taking a quick trip home from college to hang out with friends and family. It’s always been an eventful time, full of fun traditions. The Wednesday before Thanksgiving is a trivia night tradition with all those who came home for the holiday. My sister and I love to organize everyone to get to a local pizza trivia night to hang out with those who have come home for the holiday or those who just decided to stay in the city instead of flying all the way home for only a couple days. It’s such a fun way to get us in the festive Thanksgivingspirit. There’s not much better than sharing a bottle of champagne and a pizza to toast a little break in your schedule! The saturday after Thanksgiving is when we really get into the Christmas spirit by picking up our Christmas trees from Home Depot. My sister and I like to get them as early as we can so we can enjoy them for as long as we can. It’s a ton of work to log multiple Christmas trees into the house and up the stairs, but it’s so worth it when we see those trees aglow with our favorite ornaments and all the twinkly lights. Have any Thanksgiving Weekend traditions of your own? Share them with me in the comments below! love the traditions. have a happy Thanksgiving! We don't have any traditions yet, but I want to since we have a 1 year old now! Just need to think of cute things! I guess going shopping for Black Friday is a tradition with family.. And we like to put up our tree! Besides getting together with family from near and far we don't have any Thanksgiving weekend traditions. It's great that you do. Happy Thanksgiving. We don't have a huge tradition in Canada for our (families) thanksgiving. But now that I'm living in the USA, I've been decorating and getting everything ready. I can't wait! Our tradition is to eat, go to a movie, come home and eat again. Real Americans right here. Ha! Fun and unique! We just like to eat and relax, especially when stores are closed and we enjoy having no other plans! I've always wanted to see Union Square during the holidays. Maybe this is the year! We started a new tradition — decorating the family tractor and trailer with tons of lights for our local Tractor Light Parade. It is a lot of fun. I'm in love with your Thanksgiving Eve Pizza/Trivia night! What a great idea. I love traditions that aren't the usual. Enjoy it this year! Because we do not celebrate thanksgiving here in the UK same time as the U.S I can not really say I have we have a tradition but we always go to church spend time there with family and friends then head home for some much needed family time. Sounds like great traditions! Hope you had a great Thanksgiving! I knew right away that was Union Square! Oh I miss living in SF. The tree lighting is fantastic. 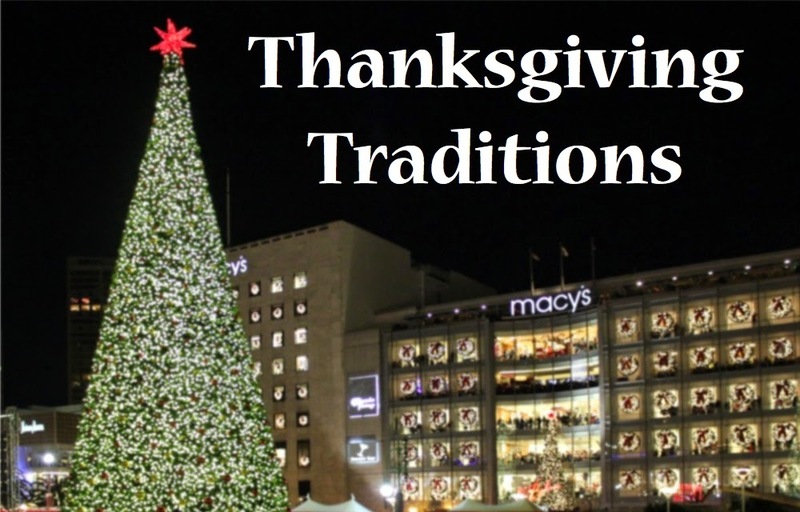 We don't have that much traditions when it comes to Thanksgiving but we do have a few that we do for Christmas. I do however try and watch the Macys Thanksgiving parade with the kids. This sounds like so much fun. I always get our tree the Saturday after Thanksgiving and start to decorate with football on and Christmas music. I love the trivia night idea- how much fun is that! Pizza trivia night — LOVE! That is such a great idea and EASY. Holiday times can become so hectic, but getting together and having easy fun is such a great idea. Happy Holidays!